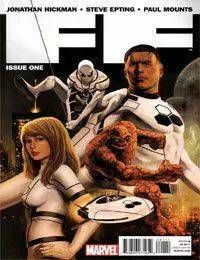 Its the FANTASTIC first issue of FF! A bold new direction for Marvels First Family featuring new members, old friends (Spider-man), older enemies (Dr doom) and uneasy alliances that will send shockwaves through the Marvel Universe. With stunning art work by Steve Epting and Paul Mounts, please join writer, Jonathan Hickman, on the second massive arc in the bold new direction for the Worlds Greatest Comic Magazine.